As you'll probably know, development of Exiled Kingdoms is officially complete with version 1.2 and even if it's possible I release more content in the years to come, right now my focus is on my next game. After 4 months and a half, many of the basic game mechanics are in place. 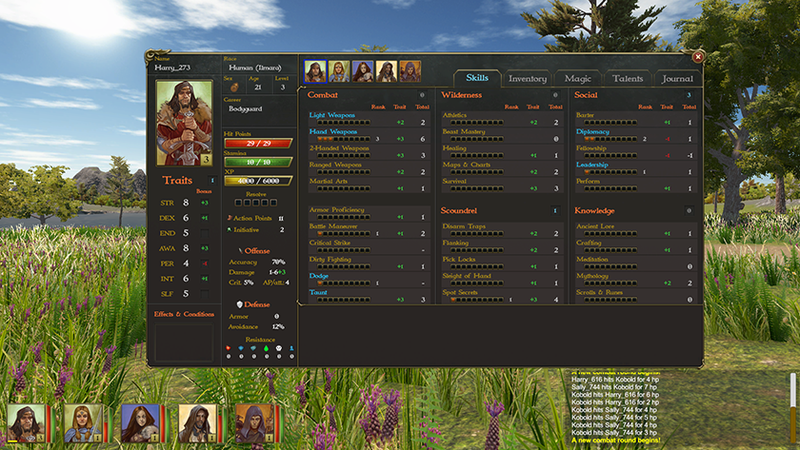 the character system already allows to level up and train skills, although most of them still don't affect anything. Excellent 2D art is being produced at a great pace, with Ignacio Corva being the project's main artist. 3D modeling and animation will begin this summer (what you see in the screenshots are just temporary placeholders, many will be improved in the actual game). Content creation hasn't started yet, but I have already written down a detailed setting guide and also outlined the game's main quest and other secondary plots. Estimated PC "Early Access" release (about 25% of game content) is scheduled for Q1 2020, full release not before Q4 2021. Archaelund will be a game targeted at the PC platform, which will try to bring back the old flavor of the Golden Era of RPGs, pretty much like I tried to do with EK on mobile. I also plan a mobile release afterwards, and it might be released on some popular consoles as well. However my priority is to make it a perfect PC game, and I won't limit functionality, design or scope because of other platforms; at this point the only thing I can confirm 100% is the PC release, although I am aware of the EK mobile fanbase and will do my best to have a mobile release as well. You'll control a full party of adventurers, and explore the broken lands of the vast continent of Andoria, home of the fallen Empire. The Exiled Kingdoms are claiming the shores of their mythical Homeland, but they'll find the region is not as deserted as they expected... prepare yourself to be inmersed in dozens of small plots and quests over a large world map once again, and to face a main plot of epic proportions (no, really!). 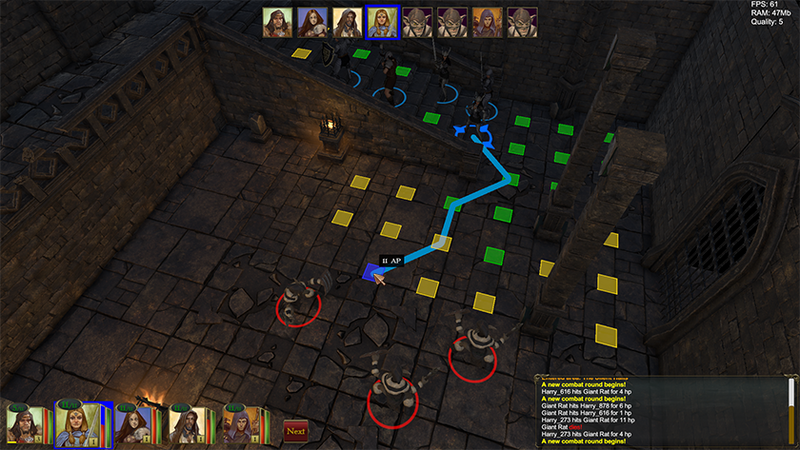 The game will feature a very unique combination of real-time exploration and careful turn-based strategy during encounters; you'll explore the world in first-person perspective in a 3D world, much like in the Elder Scrolls games or in the classic Wizardry or Might&Magic games. But battles will happen in isometric perspective! 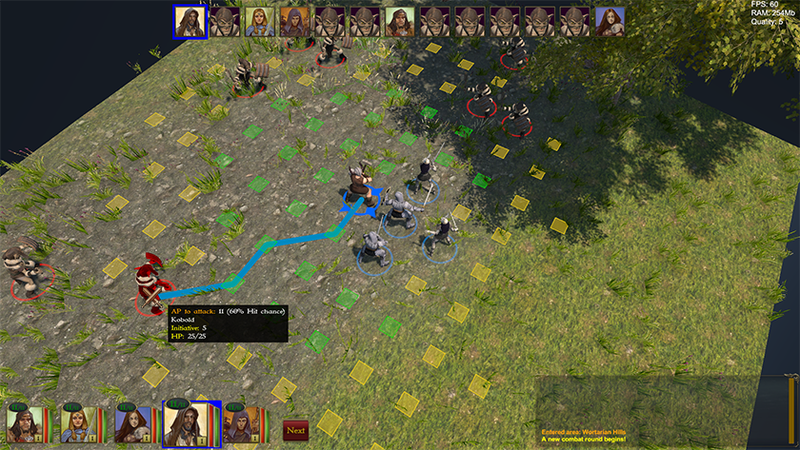 When combat begins the camera floats up to offer a top-down view of the scene, so you can individually move your party members. The idea is to have the best of both worlds: an immersive exploration and tactical combat at the same time, allowing huge epic battles. As far as I know, no modern RPG has done this before; classical games like Pool of Radiance or Betrayal at Krondor did, but in a very limited way and using much simpler graphics. I'm developing a full-fledged rule system called Geryon for this game, with dozens of classes, skills and a huge list of spells and abilities. Still I'm carefully designing the progression to make it intuitive and quick to understand. The combinations of races, classes and builds will be immense, so it's impossible to have everything on your party in a single playthrough. Content will be, as you probably imagine, an important part of the game. Expect the same open-world design, and the same weird combination of seriousness and silly humor and themes you "enjoyed" in EK; yeah, I am afraid the terrible jokes stay, and might get even worse. I already have a large list of ideas for side-quests, and a very interesting plot in mind for the main quest as well; when all is said and done I'll try to have a game that spans over 100h for the "completionist" player. EDIT: this post initially talked about Project Geryon and didn't include much information nor any images, now the name of the game is public so I updated it for clarity. Some posts below may refer to Geryon still, or not take into account some of the info added later. I'll still use the Geryon name to refer to the rulesystem of the game, which I may reuse for other projects. I'm still hoping for character customization and item aesthetic. Just like you mentioned Elder Scrolls, i'm imagining the combat system to be somewhat Skyrim-like, Dragon Age II or something like JRPGs such as Chaos Rings or Final Fantasy. I'm still hoping for character customization and item aesthetic. Indeed characters will be visually customizable and gear will be far more varied than in EK, and that'll be one of the advantages of moving to 3D. Same thing with animations, particles, etc. Exiled Kingdoms is not as varied in that regard because it's a 2D game, which makes it very hard and resource-eating because all sprites need to be pre-rendered and kept in a texture, then every texture is used to compose the image of a character, like in children's paperdolls. Have a look even at all-time-great 2D isometric games like Baldur's Gate or Arcanum; their character sprites are just a little more varied than EK's. A few years later on the first 3D titles in the mid 2000s, the variety of visuals is multiplied because in a 3D game adding new models and animations is much simpler. I'll miss the charm from 2D though! Family therapy sessions happen on the 3rd Monday of the month. Will combat be triggered by unseen random encounters (like a lot of RPGs) or by getting within a certain distance of monsters you can see (and avoid?) in the 3D view? Sometimes you'll be able to see (or hear) them and avoid them, or even surprise then. They won't spawn out of nowhere. But in indoors areas visibility will make it harder. Oh you wet, you weed, you mite! I will utterly tough you up! IMHO It has the best turn-based combat system ever (together with Temple of Elemental Evil, which I also replayed recently).